Photo: the White Mosque at the Bolghar archaeological site in Tatarstan, Sophia Freuden, 2017. The Russian language affords a critical nuance where none exists in English, denoting the difference between ethnic Russians—the former—and Russian citizens—the latter. In the neverending list of misunderstandings and purely unknowns Westerners have about Russia, its ethnic composition is just as problematic as the others: language, general mentality, historical worldview. The lack of linguistic nuance points to just how deeply seated this problem is, however, and even well-informed scholars of international relations suffer as a result. Because Russia’s ethno-politics ties into other political and economic problems that plague Russia, understanding interethnic relations—and tensions—is vital to understanding Russia as a whole. Despite its outward appearance, the Russian Federation (Российская Федерация, Rossiiskaya Federatsiya) is not terribly united. Home to over 160 ethnic groups, ethnic Russians comprised 79.83% of all inhabitants in the 2002 census. The next largest ethnic groups include Tatars, a Turkic and predominantly Sunni Muslim group, Ukrainians, Bashkirs, and Chuvash. The latter two are also Turkic. Russia’s diverse ethnic makeup is a result of its sprawling territory, stretching nine time zones from Central Europe to Eastern Asia. Maintaining its internal stability was a struggle for imperial tsars and Soviet leaders alike, as political control fractured where differing ethnic and religious groups clashed. The state has employed various tools to enforce domestic order over the centuries, including mandated teaching of the Russian language and religious conversion to Russian Orthodox Christianity. Much of this is alive and well today, most notably in the form of political and economic centralization and the marginalization of minority languages in schools and governance. Moscow increasingly wants a greater share of tax and hydrocarbon revenues, meanwhile giving fewer state resources to the regions and oppressing minority culture and language where it can. The political structure of regions within Russia is unique and further complicates interethnic relations. As a comparison, the United States is comprised of 50 states, one federal district, and a handful of territories. Russia has a whopping 85 federal subjects: 22 republics, nine krais, 46 oblasts, three federal cities, one autonomous oblast, and four autonomous okrugs. While historically each of these categories was named for a specific reason, the republics stand out due to their explicit ethnic autonomy. Each republic is home to an ethnic minority—which often is the largest ethnic group in their republic—and therefore is a bastion of that group’s culture, language, and history. Ideally, these autonomous republics teach their native language in schools and universities alongside Russian and generally conduct their local governance and economy without excessive interference from Moscow. Treaties and other political agreements have been used to ensure this, but have come under attack in recent years from Russia’s premier and his regime. Since his assumption of power on New Year’s Eve in 1999, Russian President Vladimir Putin has proved adept at wrangling the massive state he presides over. This is accomplished through his power vertical, a political restructuring of Russia that has occurred over the past 18 years. This has culminated in aforementioned shifts of power and funds to Moscow, the latter of which invariably end up in the pockets of Russia’s notorious oligarchs. Of the 200 recently sanctioned individuals on the “Putin List,” the 25 richest individuals alone are worth approximately $266.7 billion. That’s 20.8% of Russia’s entire 2016 GDP. These oligarchs accrue and maintain their wealth through a variety of means, but Russia’s republics certainly provide a portion of that wealth. 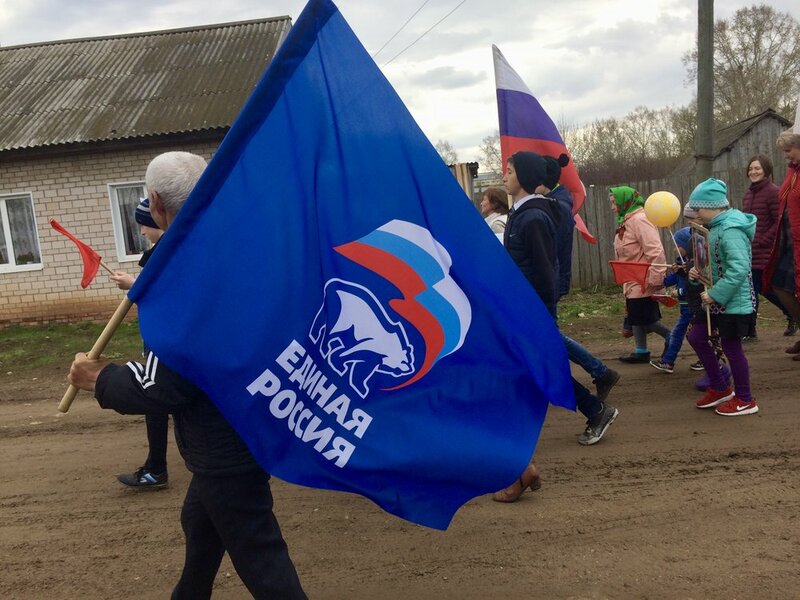 United Russia's flag on display at a Victory Day march in rural Russia, allegedly a national and non-political holiday. The crown jewel of Putin’s centralization is United Russia (Единая Россия, Edinaya Rossiya), the political party created during the twilight of the chaotic 1990s in Russia. The party’s creation was not initially to advance any individual’s agenda, but rather to fit the needs of those struggling for power in Russia at the time. Putin did not take long to seize the opportunity, however. United Russia has since become the single largest party in the State Duma, Russia’s lower house of parliament. Out of 450 total seats in the house, the party grew from 238 seats in to 343 seats after the 2016 legislative elections, acquiring the supermajority needed in the Duma to pass legislation without votes from other parties. United Russia seems popular, then, to those unfamiliar with the landscape of Russian politics. In both presidential and legislative elections, there are chronically reports of ballet stuffing, double voting, and voter coercion. This is an agenda forced from the top down, and affects Russian citizens in the smallest of communities—especially in the republics, where “United” Russia could not be more ironically named. Like any autocratic state, the Russian government enforces compliance from its citizens through a mix of legal oppression, corruption, and state-run propaganda. The Russian government has honed this last tool especially well, particularly via televised news. Two of the three main TV channels in Russia are controlled by the state, and the third is owned by state-controlled Gazprom, the natural gas giant. Supplemented by radio, print news, and groomed material in the education system, Russian citizens are surrounded by pro-Kremlin views every day. I had the opportunity to experience this firsthand in my 13 cumulative months in Russia. My first venture to Russia was a four-month stay in St. Petersburg with a host mother and father who were ardent supporters of Putin and United Russia. Pro-Kremlin sentiment was at an all-time high then, just months after the Russian annexation of Crimea. Scripture from the Quran visible at the Bolghar archaeological site in Tatarstan. My second experience in Russia, where I lived with and taught English to university students in Kazan, was markedly different. Kazan is situated in the Republic of Tatarstan, home to the Tatar people and their language. According to the 2010 census, Tatarstan’s ethnic composition is 48.1% Tatars, 43.1% ethnic Russians, and much smaller percentages of Chuvash, Udmurts, Mari, and Bashkirs. Accordingly, Sunni Islam prevails in Tatarstan. Mosques are just as common as churches, and one cannot roam the streets of Kazan without seeing signage printed in Tatar. Tatarstan is unique in that it has close relationship with Moscow. An oil-rich region and relatively populous republic, Tatarstan has been the recipient of much federal funding in the last decade. This is visibly noticeable in Kazan, where massive reconstruction efforts have resulted in repaired historical buildings, new parks, and dozens of new sports facilities to host the 2018 FIFA World Cup, among other international sporting events. My own host university in Kazan was headquartered in one such construction project, the Universiade Village. A source of national pride for Tatars and ethnic Russians alike, the village and similar projects had rejuvenated a city that in years past had been neglected much like the rest of provincial Russia. The Tatar language is therefore uniquely privileged in Russia. Until recently, Tatar lessons in schools and universities were mandatory for all students in Tatarstan. Many of my students spoke Tatar at home, and many more had acquired fluency of it through education and sheer immersion. Few fear for the life of the Tatar language, and Tatar culture is thriving as well. This is showcased in tourist sites throughout Tatarstan, including the breathtaking Kazan Kremlin and Bolghar archaeological site. Other regions of Russia, however, are not so fortunate. Udmurtia is the fifth largest Russian republic by population and is home to the Udmurts, a Uralic people that speak Udmurt and largely belong to the Russian Orthodox church. Udmurt is a Finno-Ugric language, linguistically similar to Finnish, Estonian, and Hungarian. To the untrained eye, Udmurt traditions appear Russian or European, but are in fact distinctly Eurasian. One of my Udmurt students invited me to her home in rural Udmurtia for a weekend, during which I had the pleasure of meeting her family and experiencing both rural Russia and Udmurtia. This particular weekend was special, however; May 9th is Victory Day in the former Soviet Union, and is an emotionally charged holiday for virtually every family in Russia. Victory Day marks the day the Soviet Union triumphed over Hitler’s Germany in World War II, a triumph won by the deaths of more than 20 million Soviet citizens. The holiday is both jovial and somber, marked by parades that more closely resemble funeral processions than the confetti-filled events Westerners are accustomed to. To be in rural Udmurtia during Victory Day is a political paradox. The general political opinion of Udmurts is apathy. Because of Udmurtia’s decidedly provincial status and smaller population, it is not granted the same benefits of Tatarstan. One can find supporters of United Russia and Putin in Udmurtia, but Moscow’s lack of support for the ethnic minority there is felt deeply. Udmurt is not widely spoken outside of homes where it is the native language, and is considered definitely endangered by the United Nations Educational, Scientific and Cultural Organization (UNESCO). Patriotic feelings run high on Victory Day, however, and ethno-political resentment is often put aside for remembrance. Because of the massive losses Russia suffered during WWII, Victory Day acts as a unifying event throughout the federation, regardless of ethnicity. Ethnic Russian, Udmurt, and Tatar families alike carry photos of their relatives who served or died during the war. Compounded by the historic pride Russian citizens feel for their country, it is a deeply emotional event. It eclipses the United States’ own sentiments about WWII and even the September 11 terror attacks. The Russian government is aware of both how deeply general Russian patriotism runs and how emotionally tied Russian families are to WWII. It has since politicized the more tangible Victory Day and the abstract notion of patriotism itself, tying support for the motherland to United Russia, Putin, and the Kremlin. While this has been a long-term trend of the Russian government, it has been exacerbated in recent years by stoking classic Russian fears of foreign invaders; this time, the boogeyman in the closet is the United States and its allies. Yoking all of these notions together, state-run media has utilized the word “fascist” to describe adversaries abroad and political opponents at home, a term that connotes Nazi Germany and its invasion of the Soviet Union. My students often shied at the topic of patriotism, saying they did not approve of the new political nature of national pride. In the regime’s narrative, a Russian citizen can only be a true patriot if they support the state in its entirety. This means accepting the corruption, economic stagnation, and political oppression of the regime, and dissent to any of it makes the dissenter a traitor or fascist. What happens when the patriot’s own republic or native language is threatened by the state, then? The politicization of Russian patriotism can pit ethnicity against national identity, a friction that is felt in Russia’s ethnic republics. Ironically, by trying to unite people in Russia via politicized patriotism, the Russian government may be provoking disunion. Russia has squeezed its republics hard, enough for even Tatarstan to begin to notice. While technology of the twentieth and twenty-first centuries has altered how differing ethnic and political groups do business, fault lines between communities are still a risk to those in power. Crimea ironically is the best example of this, as it was the only region in Ukraine whose ethnic majority was Russians. Crimea and eastern, more ethnically Russian regions of Ukraine had long felt oppressed by ethnic Ukrainians in Kiev, similar to the situation in Russia with Moscow and the republics. Now those regions have either been annexed or are mired in a civil war with pro-Kiev forces. It is highly unlikely that Russia’s republics will rebel against Moscow, but unrelated political and economic pressures could put steam in republics’ efforts for greater autonomy. Russia’s economy, while no longer technically in recession, is growing at a sluggish rate. This is compounded by dismal long-term forecasts for hydrocarbon prices; Russia has fallen too deeply in love with its oil and gas, and its economy reflects that. Furthermore, a demographic crisis looms on Russia’s horizon, as more people die in Russia than are born every year. Young Russian citizens are increasingly wary of their president and his regime, shunning the news consumption habits of their parents and flocking to the internet for information and entertainment. The Russian government’s recent efforts to censor the internet could prove to be fuel on the fire, as Russian citizens have largely enjoyed a free internet until now. Regardless of what transpires in Russia, outsiders should take note of the ethnic and linguistic diversity that exists in Russia. Those in the United States should see familiarity in the many groups that comprise Russia, as the U.S. is similarly a pluralistic and culturally diverse country. In time, English speakers may develop their own words for russkii and rossiiskii, and with it, a more nuanced understanding of the country. That is certainly my hope. Sophia Freuden is a recent participant in the Fulbright Program in Russia and a former intern for the U.S. Department of State. All photos by the author, not available for public use.